The bulk of 2017’s marketwide bullishness was led by the tech-heavy Nasdaq Composite. The composite rallied 27% last year, and is up 13% so far this year. That’s far better than the S&P 500 or the thirty Dow Jones stocks have collectively performed … for either timeframe. The past doesn’t necessarily dictate the future though. Indeed, yesterday’s leaders often become tomorrow’s laggards, and vice versa. 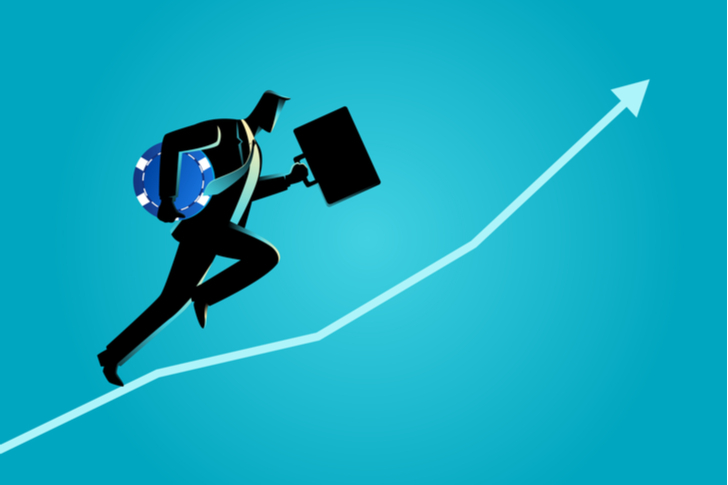 It’s a premise that appears particularly pertinent right now, with the Nasdaq running out of gas and investors starting to sniff around for safer havens. Many of these safe havens are, of course, blue chip Dow Jones stocks. Not every Dow name has been testing record highs just yet though. Indeed, several of them have more or less remained stuck in neutral, biding their time. Bullishness is brewing though. These stocks just need a little time, and the right catalyst. To that end, here’s a rundown of the ten Dow Jones stocks that haven’t taken flight, but could do so very soon. 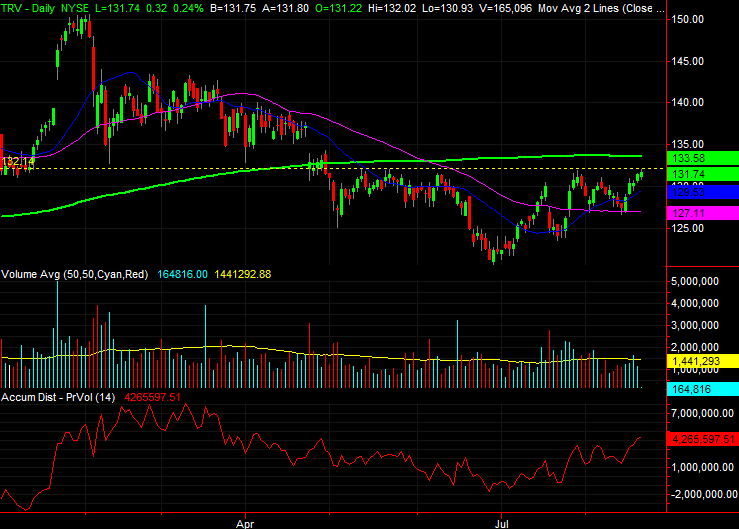 Credit care outfit American Express (NYSE:AXP) won’t come cheap … on a trailing basis. You don’t own stocks for where they’ve been though. You own them for where they’re going. And given where American Express is going, it is cheap, priced at only 12.9 times its forward-looking earnings. With the economy as robust as it has been in years and paychecks on the rise, consumers are spending — and charging — like never before. Total credit card debt in the United States is now at record levels of just above $1 trillion. That doesn’t directly help AmEx, as it offers a “charge card” rather than a conventional credit card. The rising tide of spending benefits the company all the same though. 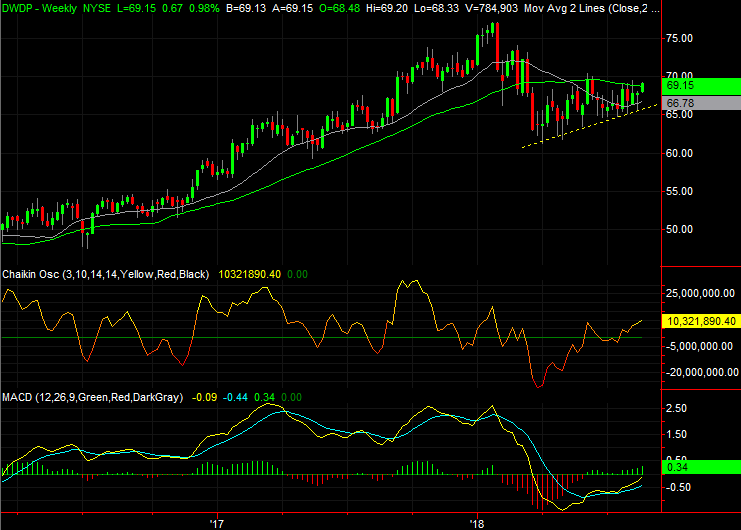 AXP hasn’t moved much on a net basis since late last year, trapped in a converging wedge pattern (yellow, dashed). In looking at the chart though, it’s clear that the stock has started to be squeezed out of the narrowing range, being pushed above the upper boundary. 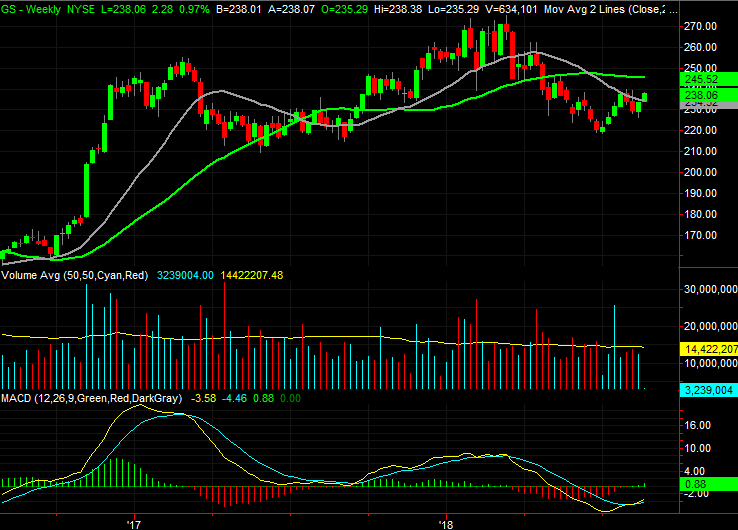 Boeing (NYSE:BA) was a champ last year, rallying nearly 100% on the heels of rapid growth in demand for air travel. The company’s long-term outlook suggests the world’s airlines will need more than 42,000 new passenger aircraft by 2037 to satisfy the annualized increase in demand for air travel of 4.7% during that time. For perspective, there are only about 24,000 passenger jets in use right now. That bullish backdrop hasn’t been able to keep the rally going this year. But, trapped in a well-defined narrow range and having just kissed its 200-day moving average line, BA shares may well be fueled up and on the runway. Given the broad slowdown seen in the home construction market, it would be easy to doubt that home improvement retailer Home Depot (NYSE:HD) has a future that’s as compelling as its recent past. That’s not necessarily a headwind that blows directly against Home Depot though. Home Depot caters just as much to the remodeling, repair and home decor crowd, and things remain solid on that front. Harvard University’s Joint Center for Housing Studies suggests that remodeling expenditures will continue to grow at around 7% through 2019, extending a long-standing streak of growth. HD shares have reflected this spending trend, albeit erratically. Although it is trending upward again now, the renewed uptrend looks relatively young compared to 2016’s and 2017’s big runups. 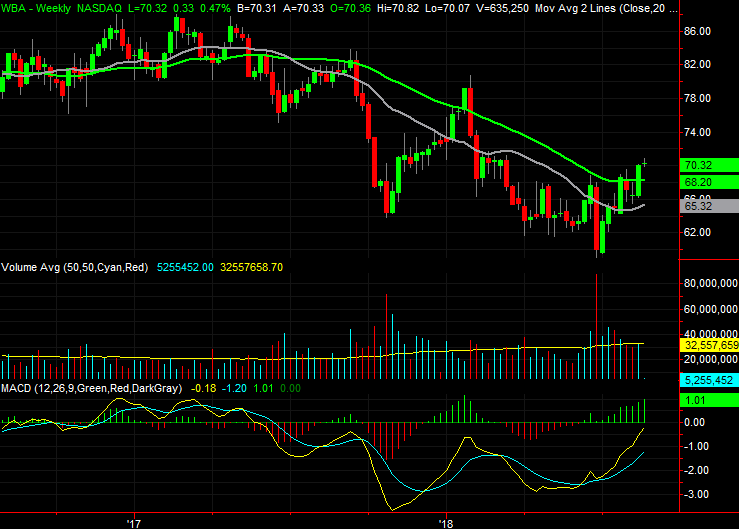 Procter & Gamble (NYSE:PG) shares are up 17% from May’s low, which would normally be a tough act to follow. In this case though, even with the big gain, the stock is still well shy of reclaiming its price levels seem just late last year. 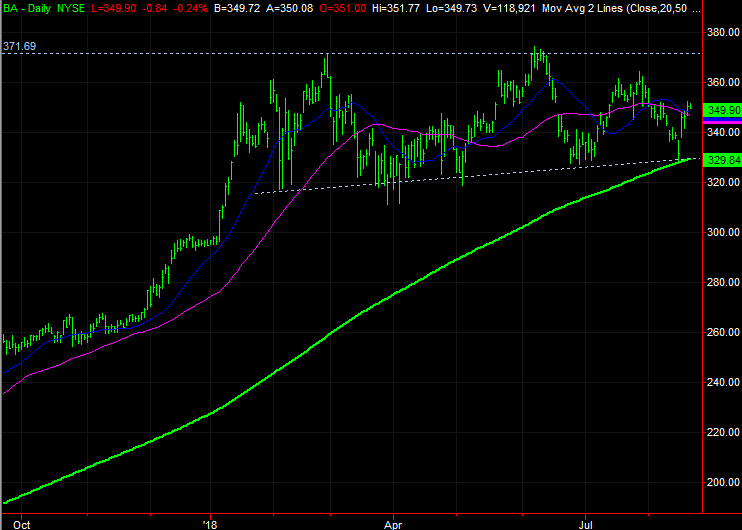 Better still, the cross above the 200-day moving average line (green) is still a fresh one. The pullback, for the record, was mostly one inspired by fears that the consumer goods business would be trapped between the impact of trade wars, rising inflation that couldn’t be passed along to consumers and increasing competition. Slowly but surely though, investors have realized those fears were more bark than bite. The market’s now unwinding its overreaction. DowDuPont (NYSE:DWDP), along with most of its chemical and agricultural materials peers, struggled late last year and early this year, with a spinoff approaching, and related expenses rising. A closer look, though, reminds us that the company is actually holding up rather well and performing nicely all the same despite plenty of worry about the impact of a trade war. 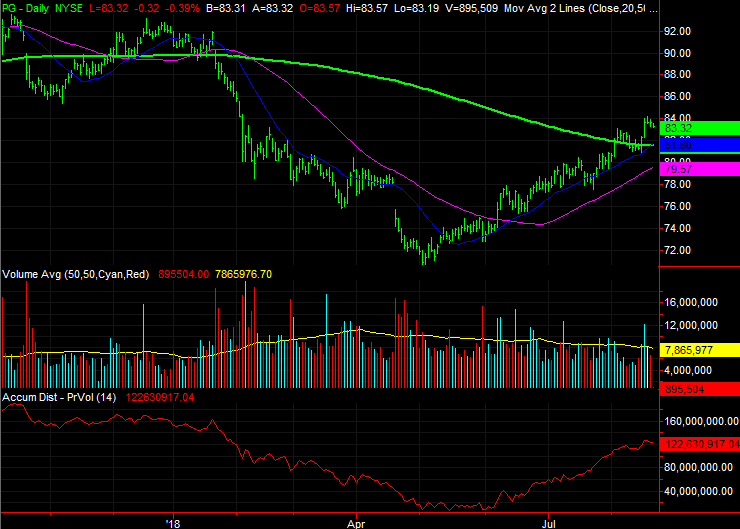 Never even mind the persistent inconsistency of the U.S. dollar. It appears traders have collectively figured out that selloff wasn’t necessary. Using a rising support line (yellow, dashed) as a pushoff point, DWDP has just cleared its 200-day moving average line (green) that had previously acted as resistance. Better still, the move is unfurling on rising volume. There’s still lots of room to recover. It’s a seemingly scary time to be stepping into investment bank (and all-things-related) Goldman Sachs (NYSE:GS). The stock’s been a poor performer of late, and with a new CEO soon taking the helm, there’s even more uncertainty in the cards. Or, maybe there isn’t as much uncertainty as the headlines suggests there is. That’s what the chart is subtly telling us anyway. GS shares are slowly but surely on the rise despite the fact that traders know veteran CEO Lloyd Blankfein is on his way out and a largely unknown David Solomon will soon take over. Investors like it. 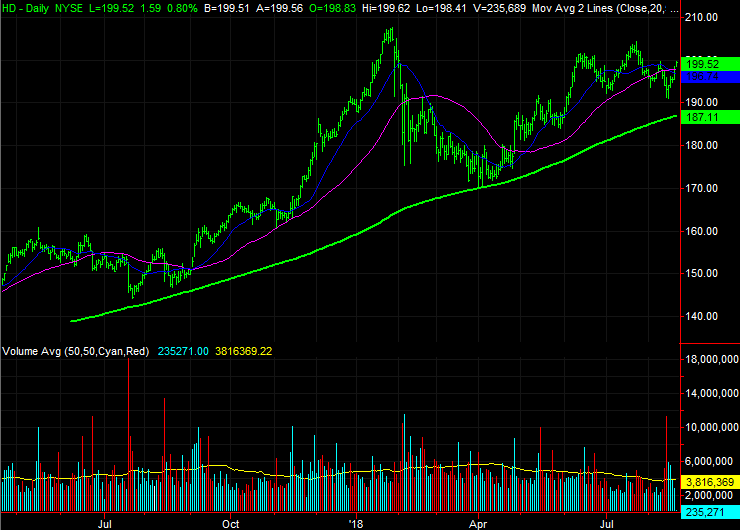 Not only are Goldman shares making higher highs, they’re doing so on rising volume. Helping drive that move is an earnings outlook that translates into a forward-looking price-to-earnings ratio of only 9.4. Drugstore chain Walgreens Boots Alliance (NASDAQ:WBA) has frustrated more than a few investors since early 2017. Falling from a high near $88 well over a year ago to a low near $60 just a few weeks ago — and dishing out a couple of bullish headfakes along the way — WBA is a difficult name to trust. The prod for the weakness? There’s more than one. One of them lies in the fact that Amazon (NASDAQ:AMZN) is getting into the pharmacy game. Another is the fact that the future of pharmaceuticals remains unclear. Yet another is the fact that some feel Walgreens overpaid for the portion of Rite-Aid (NYSE:RAD) it finally acquired not that long ago. The market’s pessimists may have overshot though, and they are now starting to correct the mistake they made with WBA. Earnings are expected to grow 17% this year and expand another 8% next year. In that light, the forward-looking P/E of 10.9 makes the stock unusually cheap and ripe for a rebound. 3M (NYSE:MMM) was a superstar in 2017, but this year has proven to be a complete disaster. Falling from January’s peak above $259 to below $200 by April, last year’s buyers have been shellshocked. Making the matter even more shocking is that 3M has continued its steady, reliable revenue and earnings progress that earned its spot as one of only thirty Dow Jones stocks to begin with. Take a closer look at the chart though. 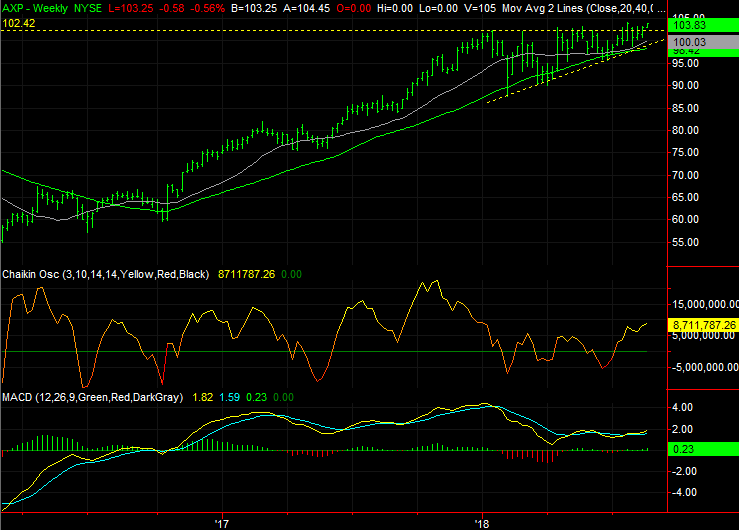 It’s subtle, but MMM has been logging higher lows and higher highs since April. There’s bullish momentum, and although it’s tepid, all big trends start out as small ones. At least part of the newfound bullishness stems from the fact that the dividend yield here has reached 2.66% in response to the stock’s falling price. Cisco (NASDAQ:CSCO) shares logged an amazing 2017, rallying 30% for the twelve-month stretch, and getting a good start for 2018 as well. Cisco stock hit a wall in February though, and it has been hitting it ever since. Namely, a technical ceiling has formed around $46.40 against a backdrop of concern that Cisco may not be able to grow as quickly as investors had been previously expecting, thanks to increasingly potent competition. Maybe that concern wasn’t merited though. Last quarter’s earnings were once again better than expected, continuing a growth streak. That’s how and why Cisco stock surged last week, though in retrospect, the push up and off the 200-day moving average line (green) helped a little. The gap near $45 may beg to be closed sooner or later, and the stock’s clearly not above the $46.40 line in the sand yet. It could take some time to fully work all the way through the process, which may mean taking a step backwards first. The stage is set though. Last but not least, add insurer Travelers Companies (NYSE:TRV) to your list of Dow Jones stocks that may be on the verge of a big rally. In retrospect, last year’s strength and January’s bullish surge made TRV an easy profit-taking target. What was surprising was the sheer magnitude of the selloff. Travelers Companies shares fell from $150 in January to a low near $120 in June … a 20% tumble that arguably wasn’t deserved given that earnings are expected to grow 35% this year and grow another 14% next year. TRV shares are only trading at 11.6 times next year’s expected bottom line. 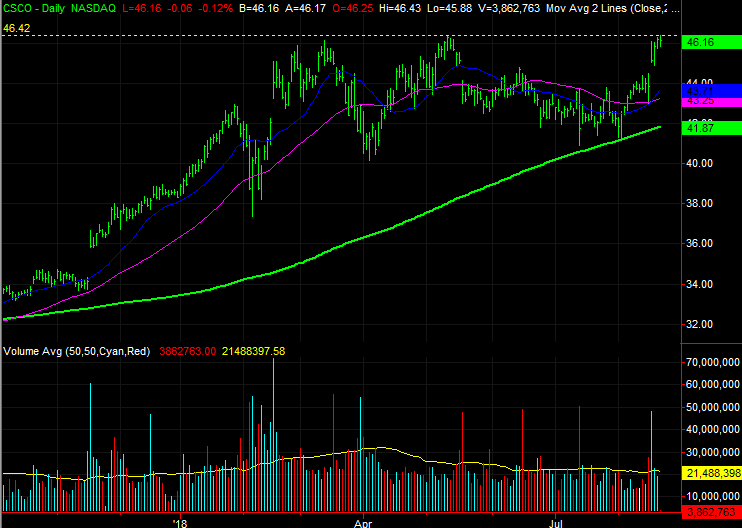 What’s most exciting about Travelers Companies here and now, though, is the shape of the budding rebound effort. 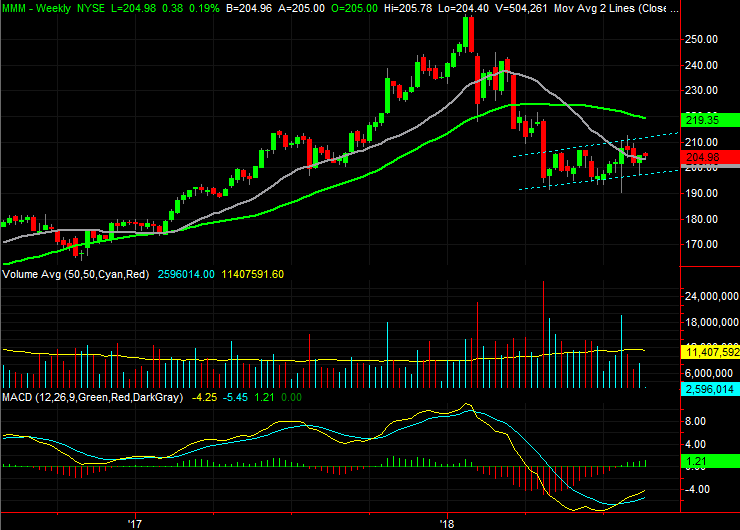 We can now look back and see the action since May has more or less been an upside-down head and shoulders pattern. Moreover, the neckline near $132 is being tested. If it fails to keep TRV contained, the buying effort could really heat up. Article printed from InvestorPlace Media, https://investorplace.com/2018/08/10-dow-jones-stocks-to-buy-before-they-rally/.